Tagged under Touya Mikanagi, Manglobe, Series. The art was really lovely in this one. The anime plot was just a little bit cut(I hope they could produce a second season for this). I like the cute and naive Nai, the bad boy yet very cool Gareki and of-course my favorite the overly hyperactive and energetic Yogi( wherever he is for sure and jokes would be flying around). The ED song was really catchy with the tandem of HIroshi Kamiya and Miyu Irino which makes it so much pleasing to the ears. I completely enjoyed this one! Totally recommended for people who's into bishounen and also into some action, fantasy and magic theme. Surely, it will live up to your expectations and even beyond your limited imagination. Before this series started to air, I've already been reading the manga of this. It's one of the recommended fantasy and action plus bishounen genre to all who are interested in this. I love the characters and their seiyuus too! I'm planning to watch this until the end! Karneval, from the name it is awesome and i don't think words will be enough for it, because the anime graphics and art are very awesome, and the characters they are all amazing, i like Karoku but he is look very suspicious, i just hope he is a good guy in the end, every thing is great in Karneval but there is a lot of unsolved and unexplained things left behind, i hope all the mysteries will be solved in the next season and will not disappoint the viewers. The art is very good. That was the first thing that made me wanna watch Karneval. N then the stories... are good enough. Even though I'm sure the ending wasnt really end yet. Watching this made me wanna try to read the manga. The stories are about a boy named Nai, who actually a rare animal, searching for someone named Karoku (who I'm not clear who he really is. maybe his master or his good friend?). Nai was saved by a teen, Gareki, who accepted to help him as long as he got his payment, which is Nai's expensive looking bracelet. N he will get it after helped Nai found Karoku. When both of them get chased by some bad guys, a young man in cat-mascot custom saved them. N he brings both of them to the plane of Circus. There, they learn something and decided to work together for their goals. The Circus actually not an ordinary Circus. 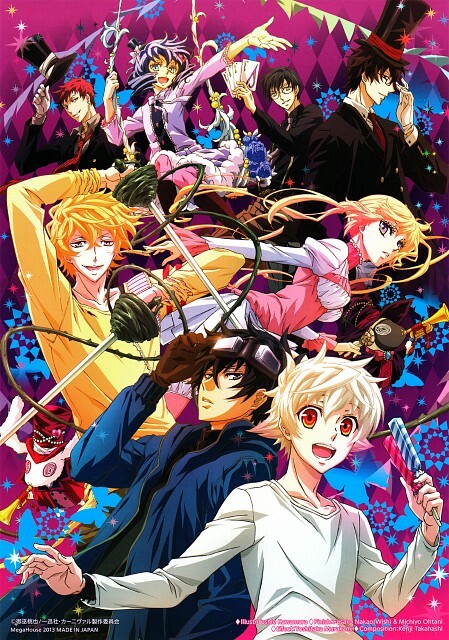 i liked the anime very much ,i love the style (about circus) the art, graphics, and music are awesome!! the story, events, are so exciting it's pull u to watch the anime and it's really worth watching, don't mention the charcters, Akari, Hirato, Gareki, Tsukomo, Iva and Karoku, they all cool characters,(except Eriska i hate her so much), the anime didn't mentioned a few points about karoku story or the bad guys story beside there are a lot of things didn't mentioned in the anime, i don't want to see the manga but i hope they make a second season soon. I just watch the anime until the episode 6. Then I started reading the manga.... OH MY. Karneval is amazing. The history have cute and cool bishounens. Sometimes is troublesome to understand, but everything is explaned in it's time. Since the manga is pretty awesome, I'm curious how they're going to wrap this up in anime. I'm keeping my fingers crossed in hope they won't ruin it like all other series *coughKuroshitsujicough* since it would be such a shame. The animation and voice actors are good so far. I really enjoyed this series, not what i expected when i first stared it but as it went on it just got amazing! I love the characters and their quirks Nai not knowing anything really, Gareki looking scary but actually being nice......sometimes, Yogi, well being Yogi and the storyline of course!